The New Toro 60 Volt Flex-Force System includes a 22-inch Personal Pace Mower, 21 inch Snow Thrower, 605 CFM Blower, and a cool new String Trimmer! 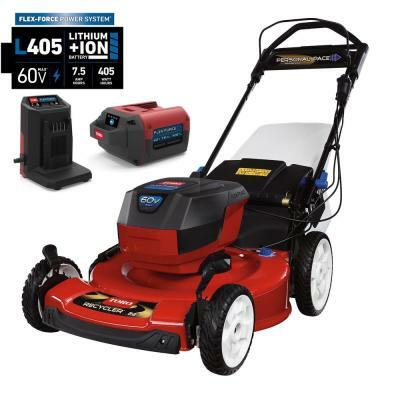 What do you get when you merge the best selling 22-inch walk-behind mower, the best selling single stage snow thrower and the leading electric blower design with the latest brushless motor/battery technology? The 2019 Toro Flex-Force! The system also includes other yard tools including a brushless push mower and 14/16 inch heavy-duty trimmer at this time. Toro, is a trusted brand with 100 years of know-how; tested and trusted; choose with confidence, knowing millions of people worldwide count on Toro lawn mowers; Toro is America’s #1 lawn mower brand. Toro always performs extensive field and lab testing before they offer a product to you. Toro is the industry-leading expert in electric blowers and other outdoor equipment solutions. They now offer powerful hand-held products that rival gas-powered products. Finally, a leading mower company is offering a state of the art walk-behind cordless mower. We all know mowers that cut, bag and mulch well are much more than spinning metal blade inside a plastic bowl…But up to this point, all we’ve pretty much had are cordless power tool companies making a mower just to sell more tools. This is the first time Toro – a mower company has taken their best-rated mower and made it electric! 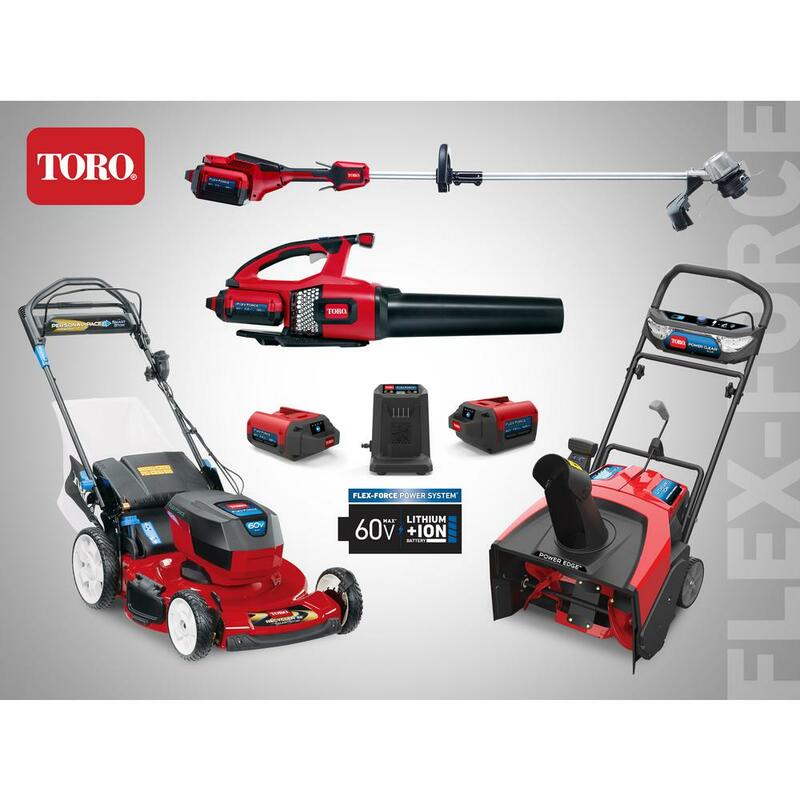 Reasons to buy the Toro Flex-Force over other brands. Largest mower deck for electric mowers. 22-inch cut! The Recycler steel deck is one of the highest rated mulch, bag, and side discharge decks in the industry. Push or the Personal Pace rear wheel drive you all know and love. 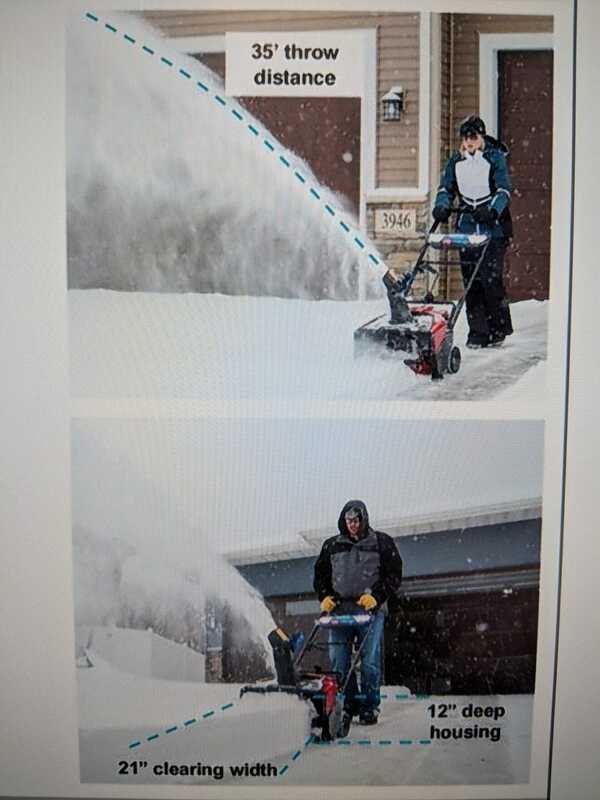 Best single stage snow thrower design. You know I always rate the Toro single-stage snow throwers as one of the best. Highest CFM handheld blower. Lightweight yet 605 CFM! One string trimmer that can easily be set up for light homeowner or heavy-duty trimming! Full 22-inch cut steel deck! I know from experience that most of you will buy a 22-inch mower over a smaller one if given the chance. This mower’s cutting width is a full 2 inches wider than the nearest competitor’s steel deck cordless mower. Don’t want Personal Pace? A Push sytle mower is also available. Comes in three packages for different size yards. Please note! **This post contains affiliate links and I will be compensated if you make a purchase after clicking on my links. 22-inch Personal Pace Recycler Deck with 7.5 AH battery. Buy at The Home Depot. Good for homeowners with 1/2 acre lots. If you think you may want the snow thrower this is the best choice. Buy this mower and buy the bare-tool snow thrower this fall. The 7.5 AH battery costs $100 more than the 6.0 AH but it will give you 33% more runtime in the snow thrower. 22-inch Personal Pace Recycler Deck with 6.0 AH battery. Buy at The Home Depot. Good for homeowners with 1/3 acre lots. I’m finding out that by having a cordless blower and string trimmer I’m more likely to just grab it and blow the back step clean or trim that one tall piece of grass around the mailbox. I don’t have to worry about buying fuel, mixing fuel, storing fuel and actually trying to start an ornery 2-cycle engine. Battery powered lawn & garden equipment is so much easier to use. 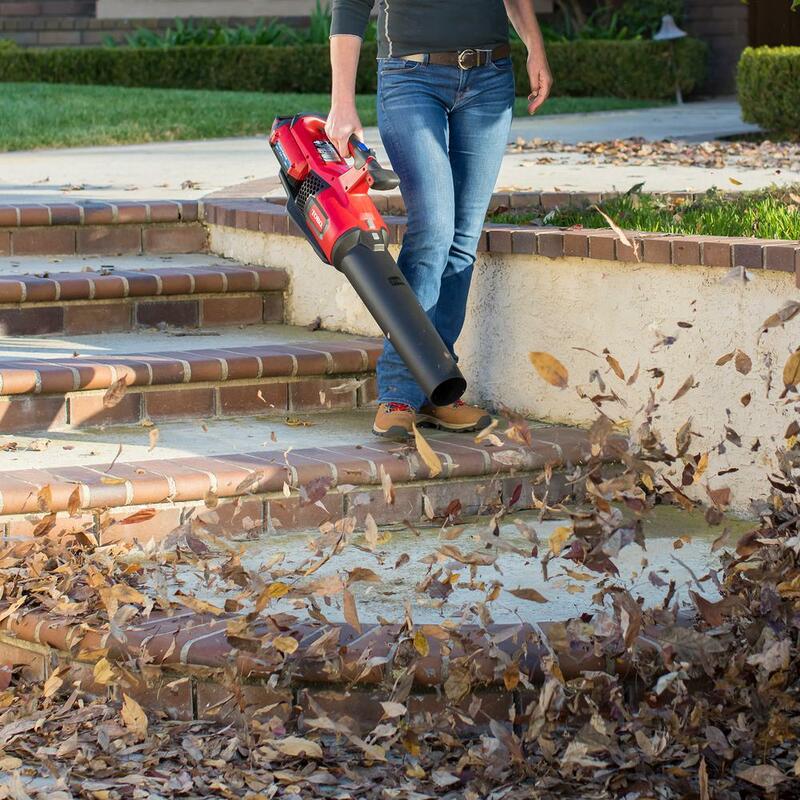 The Toro Force-Flex String Trimmer and Blower will now give you trimming power and blowing force of commercial equipment at a homeowner price! Let’s start with the trimmer. Instead of offering 2, 3 or 6 different trimmers you have to decide to buy from Toro has just one that can be quickly changed for the type of trimming you want it to do. You can set it up for max run time, trimming large areas or heavy-duty trimming. The String Trimmer can use either .080 or .095 trimmer line. It can also trim a 14 or 16-inch swath. Set it up with .080 at 14 inches and you will get the maximum run time for large trimming tasks. Use the .080 set at 16 inches for those slopes you can’t mow with a trimmer but still want to keep it trimmed regularly so it looks like the rest of your lawn. Use the .095 line at 14 inches for tasks like chain link fence where you need the strength of commercial line. Finally, use the .095 line and 16-inch width for larger areas you only trim a few times a year. Multiple Batteries: Can use the 2.5 AH battery for normal trimming on your 1/2 to 2-acre yard or the 6.0 and 7.5 AH from your mower/snow thrower for large tasks. Variable-speed trigger and turbo-boost button. Cruise control feature and ergonomic handle, designed to reduce arm fatigue. Extended power, run time and product life, thanks to a high-performance brushless DC motor that outperforms brushed motors. With 135 Watt-hours, the L135 battery provides up to 90 minutes of run time on low speed. The L135 Smart battery has intelligent software that maximizes run time and performance. Choose Toro with confidence to save time, eliminate hassles and have a great-looking yard. Count on it. Save your strength, stay comfortable and tackle big jobs with less effort. The cruise control feature and ergonomic handle are designed to reduce arm fatigue. All-season power more products in the Flex-Force battery line, from mowers to string trimmers to snowblowers (coming soon). Enjoy performance year round with more products in the Flex-Force battery line. Expand your tools to make less work and save money on your next purchase of a bare tool. Toro has the best single stage gas snow thrower. The new Toro Force-Flex takes all that history and experience to give you the very best cordless snow thrower! 12-inch high intake, full 21-inch clearing width. Only requires one battery for operation. New patented pending steel auger design breaks down heavy, wet snow and enables faster-clearing speed with longer battery life. Brushless DC motor provides more power, more runtime, and longer life. See and be seen with new panoramic lighting. Two speed ranges to match the power to the job. Toro’s Quick-turn chute control that you like! Toro’s locking zip deflector. It’s much faster and easier to use than the wingnut style on other brands. Adjustable folding handle for comfort and storage. Get the job done 25% faster with Toro’s new patented steel auger design. New design pulls itself through the snow. Toro’s brand reputation and full coverage warranty are the best in the industry! Will an Electric Mower Save You Money and Cut Lawn Care Costs? Yes, You need a new gas can! = $30 Total Cost $430. Blade sharpening, blade replacement, and self-propel drive belt will cost the same so I won’t include it in the cost. Do you know who’s making these batteries for Toro? i wonder how the mower and snow blower will compare against EGOs stuff. Paul, isn’t your math wrong on the charge for electricity each year? For 20 charges, it would have to be $1.60 per charge to get $32. 16 cents x 20 times = $3.20. Or am I misreading this? 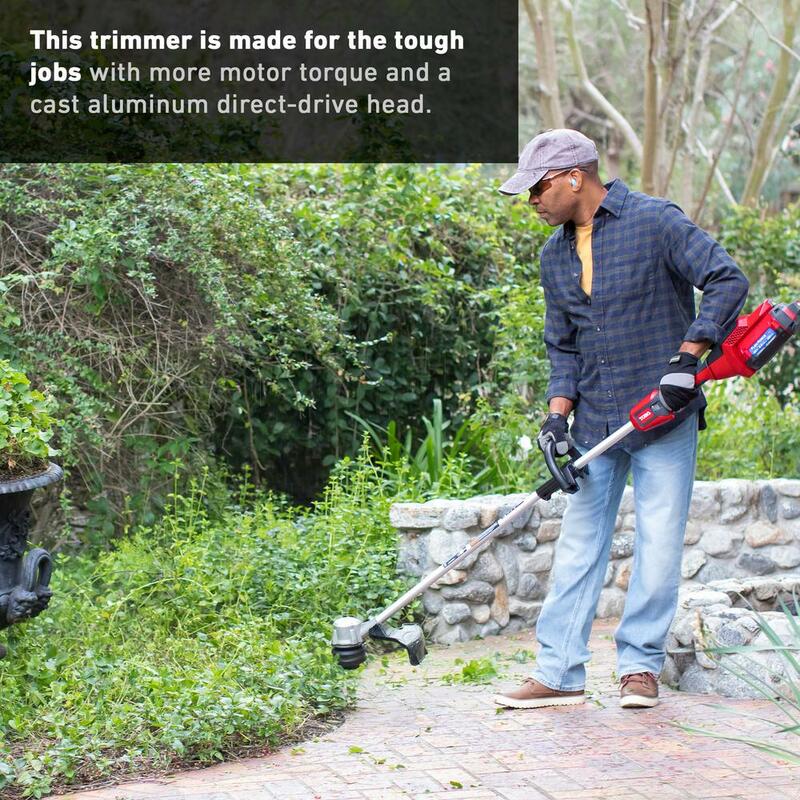 I just read the article of the Toro Force-Flex Trimmer and Blower and sounds interesting. It sounds like the batteries for the trimmer and blower are similar, could they both be used on either tool? Also do you keep the batteries plugged in all the time or unplug when the batteries are full?